So . . . What now? What do I have to do? It sounds like your thoughts are like horses and all you have to do is build a fence around them and they’ll stay corralled and under control. Or they’re like a swarm of mosquitos; unlikable, pesky things that you shoo away with all get-out with some kind of fly swatter or bug repellent (the soy kind). Or perhaps more like a barking dog tied to a post and hopefully you can find the muzzle. Hmmm – I don’t know how to do that with my thoughts. Do you? Do I deal with each thought separately or do I lump them all together? When this is taught in most yoga or meditation classes, sometimes the translation of the sutra gets lost and teachers and students tend to talk about stopping a thought or a number of them. I suppose it’s a Christian thing – you know, your thoughts are the sin or . . . it’s not about what you think but rather what you do with the thought, or it is what you think and what you do with the thought, etc. Confusing, isn’t it? It occurs to me that that must have been misquoted for centuries probably as well. Stopping thoughts always catches people up. After talking to a lot of people, it is the one thing that most fixate on. What I’ve been taught and what I’ve experienced though, is that it is the movement of thought rather than the individual thought itself. But how do you stop movement? And is that what we’re supposed to do? The movement of thoughts to me is like the movement of air like wind. Sometimes it’s gusty, and sometimes it’s gale force strength. And other times, it’s a welcomed breeze. Thoughts flow constantly. Sometimes you take notice. Sometimes you don’t. So when do you take notice of thoughts? When they bother you of course. When someone says something that just gets under your skin, or when something happens and you have a strong reaction to it – like you feel embarrassed, or when you have to get or do something because your life depended on it. All worthy thoughts. How many times have you reiterated a conversation in your head hours, days after the conversation – or before the conversation has even happened . . . even if you didn’t want to think about it, yet there it is? What makes thought waves so powerful? Pema Chödron said that her teacher Chogyam Trungpa Rinpoche would say – it is not the negative, but it is the negative about the negative. In other words, it is not the thought, but the thought about the thought which turns into another thought about that thought and so on, that gets us into trouble. I remember my first meditation retreat some years ago. I am a self-declared ‘idea’ person; Give me a problem and I will give you a number of solutions that are pretty creative and sometimes even original. Anyway, I was at this meditation retreat for the first time, sitting Zazen. I was determined to do a good job. I went with a friend who is a seasoned sitter, and so I mimicked him the first day. I sat for 4 hours straight without moving. OMG – I was so sore for the rest of the time. In order to get through this, I made sure I sat a lot (it was a very relaxed atmosphere about your schedule to sit – still very strict about eye contact and silence.) I battled the whole way through. I sat and sat, and still my thoughts came, ideas about: how to fix the roof; what gifts I can make each and every person there because they are so great; how much I wished I could eat (I was fasting as well); how much I wished I could wash my hair (little facility to do that at this place), and how I was right about being eaten alive by mosquitos (it was a hot week in August). Afterward, I told my teacher I found out how I wasn’t as still and silent as I thought I was; I had always thought that I was a pretty laid back, quiet person. But I wasn’t. Maybe that’s why some of you don’t want to do the meditation that asks you to be still. It can be a pretty shocking, and an eye opening experience, and some of you may not want to know. Through my years of practice, I learned that thoughts will always come and go, but it is most certainly about how your organism responds to those thoughts. “Yoga is the suppression of the transformation of the thinking principle”, as someone else puts it. Suppression? Hmm. I am not a fan of our potential interpretation of the word suppression. In psycho-talk, it can be interpreted as ‘swallowing’ or ‘eating’ your thoughts or words and that never ends well. How I have experienced this, “suppression of the transformation of the thinking principle” has taken a number of years of hard work to understand my reactive responses to external stimuli. Most of us react because we feel threatened by something/someone, or, we are anxious to prove something, and so on. What needs to happen is simultaneous to developing a Still Mind. Once you develop the Buddha Mind, you will realize that you are not separate and there is no threat (really) because there is no you. Before you develop Buddha Mind, you struggle with all the thoughts which anchor you into an identity that is separate. In other words, you need to develop Buddha Mind before you can transcend your reactionary self and you need to transcend your reactionary self before you can realize Buddha Mind. It is a paradox. Like peeling the onion, or chipping away at a stone. The only way through is to open your heart and risk the death that all of us are so afraid of – ego-death. I always liked the word Transformation. Here it is talking about the transformation of the thinking principle. Transformation? Is a thought a thought if you don’t react to it? Like the falling tree in the forest thing – it is a conundrum. Is the mind-stuff just like scattered dust particles in the air and only when you start to collect them do they become annoying dust-bunnies? Is that what “transforms” thought particles into real thoughts, whether you organize them, collect them or corral them? Movement of thoughts is the undulation of the mind when it is reactive. Now we’re getting somewhere. It is not the thought that needs work, but the reactive mind. A lot of yogis/yoginis, swamis, etc. say that any kind of therapy is not necessary when you do yoga. But the key here is that you do “YOGA”, not little ‘y‘ yoga (mostly asana practice) or what it has now turned into because it is mostly a hedonistic practice to most – bhoga (meaning, doing yoga for its own sake for the appeasement of your own ego – i.e. look at what I can do). To do YOGA is to delve into the workings of your mind and how it effects your Being. Awareness is key, and to affect awareness, there needs to be some sort of dialogue (with a teacher who knows, a therapist who knows, etc.). But this is still not Wakefulness. Almost every yogi/yogini I know equates being aware of the present moment, of what you do or say in that moment, of how your organism reacts and so on, to and in line with Enligthenment. But this is not so. In awareness, there is still the “I” – You are aware. This is really only the beginning. The process that is the Heart Path will take you Home. The Heart Path really to me is about the final step toward Enlightenment and that is “Acceptance”. You have seen who you are and you accept it. You don’t try to hide, mask or manipulate it. You have seen the world as it is – truly, and you don’t run from it, or hide. And you don’t try to manipulate it. You have seen what other people are like and you don’t do anything to change them. You just accept them. You have seen the truth of the wild, untamed world of animals, vegetable, mineral and you see them for what they are. Without greed or fear in your Heart. There is only Love. My friend says this – Yoga (Union) is just that. You need nothing else. We’re already there. Yoga IS the Cessation of the Thought Waves. That is Yoga. Yes, yes, yes I say. 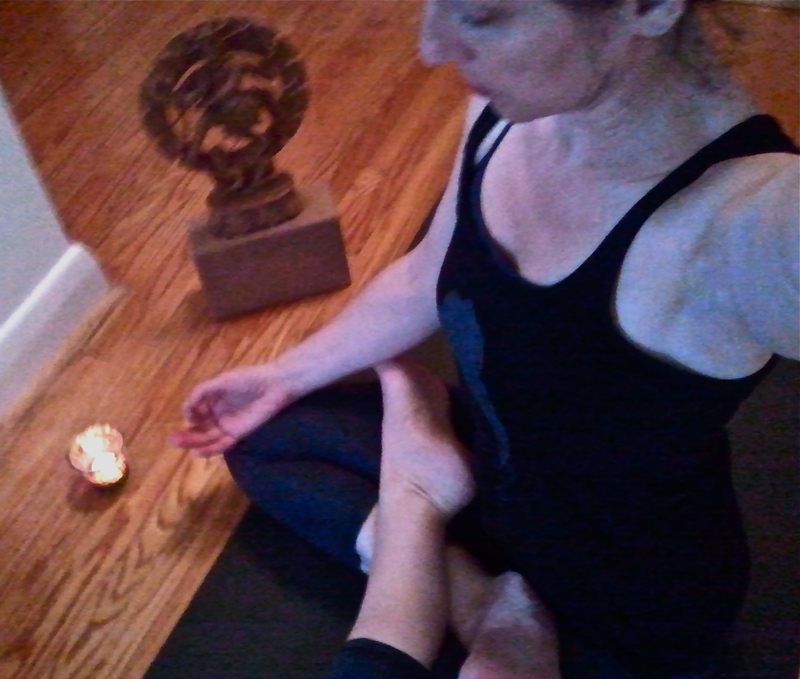 It is that simple.
. . . Yoga is the Stillness Within. Let It Be.